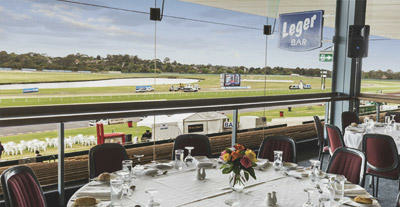 Australian Bloodstock owners hub, providing raceday dining options and more. To view your horses web page, pedigree and information click on your horses name from the list on the left. Our Owner Hub is to keep you informed of dining options, ticketing, owner features and more. Hunter syndication company Australian Bloodstock have added Manion Cup winner Midterm to their impressive roster of stayers. 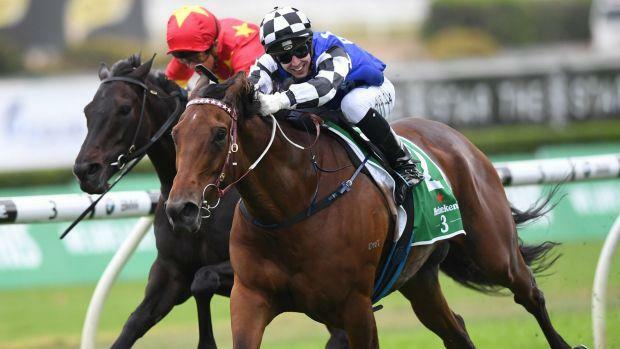 Midterm beat Australian Bloodstock's Shraaoh to claim the Manion Cup on heavy going on Golden Slipper day at Rosehill for high-profile owner Lloyd Williams. The six-year-old gelding was then ninth in the $2 million Sydney Cup on by Shraaoh on a good surface at Randwick last Saturday. The British import has won four times in 19 starts for $350,640 in prizemoney. It has one win in eight Australian starts. Australian Bloodstock director Luke Murrell said Midterm would go to Wyong trainer Kim Waugh. "I'm not quite sure he runs 3200, which is probably the only thing with him," Murrell said. "But I just really like the horse. I think there's still a bit of upside with him even though he's an older horse. And Kim has done a good job with Our Century. "This horse should have won the group 1 Metropolitan [when fifth] in the spring so I think he's at that level. "We're happy to be punching around at group 1 and 2 level. He may not get to the Melbourne Cup distance, but he should be good fun." Murrell said the Chris Waller-trained Shraaoh has been spelled and will be set for the Melbourne Cup, where he believes he could be a top-six chance. Australian Bloodstock, winner of the 2014 Melbourne Cup with Protectionist, also had the Kris Lees-trained Big Duke, Red Cardinal and Doukhan in the Sydney Cup. 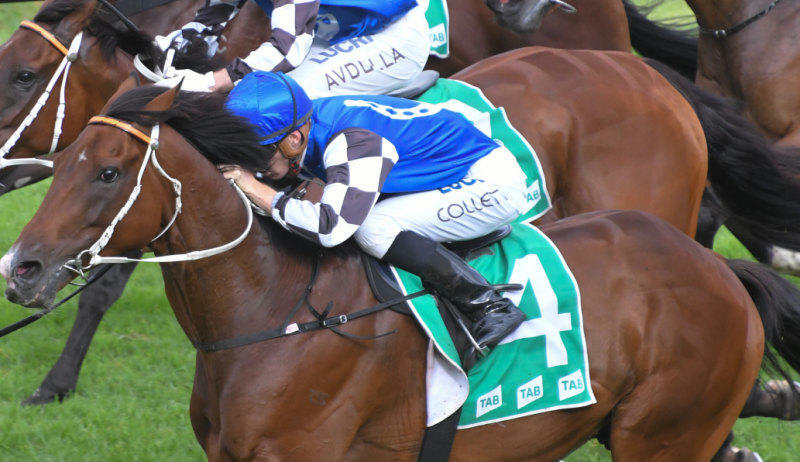 Big Duke will have a short break before being aimed at the Doomben and Brisbane Cups. Murrell said Red Cardinal could follow the same path but Doukhan, which was fifth in the Sydney Cup, will head to the McKell Cup next month, into the Stayers Cup. Meanwhile, three-time group 1 winner Le Romain could have another crack at the Kingsford-Smith Cup at Eagle Farm (1300m) next month. Second in the group 1 last year, Le Romain will first try to go one better in the All Aged Stakes (1400m) at Randwick on Saturday. The six-year-old gelding has been second in the past two All Aged Stakes from wide barriers and he has the extreme outside this time around. Lees will put blinkers on Le Romain for the first time after a last-start ninth in the Doncaster Mile. "He's worn winkers a few times and I thought a bit of a change, with a view to dropping him back in distance, might just be something to stimulate him a bit," Lees told AAP. "He had a few days at the beach and went on the water walker for a couple of days, then he had a gallop Tuesday morning in the blinkers and pleased me." Lees also has Asharani in the JHB Carr Stakes and Miss Que in the Hall Mark Stakes, both at group 3 level. 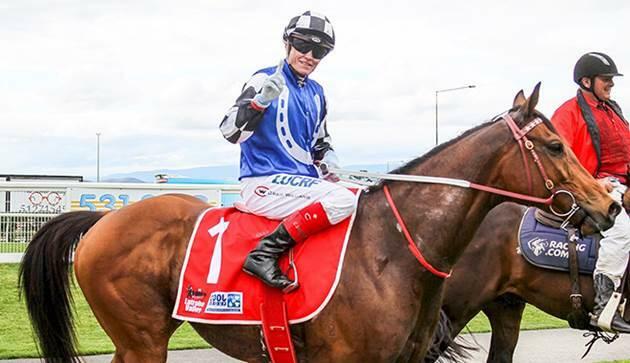 Sammie Clenton will have the first Saturday metropolitan rides of her comeback aboard Star Shaft for Tim McIntosh and Tougherthantherest for Keith Dryden. 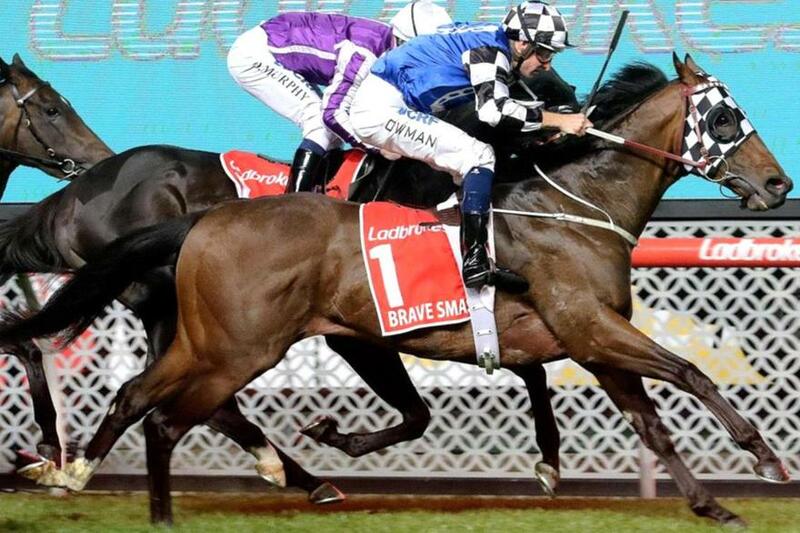 Japanese import Brave Smash has been retired to stud after failing to meet his international challenge in Dubai last weekend. The dual G1 winner by Tosen Phantom will stand at Aquis Farm in the NSW Hunter Valley after his syndicate abandoned plans for him to race on in Hong Kong or the UK. Brave Smash, winner of the G1 Futurity Stakes and G1 Manikato Stakes, finished unplaced in last Saturday’s G1 Al Quoz Sprint at Meydan. Australian Bloodstock purchased Brave Smash from Japan in 2017 with the stallion going on to earn more than $3.5 million. He will stand for $22,000 inc GST in his first season at Aquis Farm. Kerrin McEvoy knows a lot about the horse he has to beat in Saturday’s Tancred Stakes but is happy to be sticking with Red Cardinal as he steps to the extended trip of 2400m at Rosehill. McEvoy was on board favourite Avilius when he won the Ranvet Stakes on Golden Slipper day last weekend but had already been booked for Red Cardinal in the Tancred when Godolphin decided to back up its imported stayer, which is the $1.70 favourite. "It is one of those things, I didn’t think they would back him up and Red Cardinal has done nothing wrong this preparation," McEvoy said. "Avilius showed last week he likes that soft ground and he is denfitely the one to beat if he backs up well. "But you can't get better form than Red Cardinal going into the race at a trip that should suit him and we should get the soft ground that he wants." Red Cardinal had not won in a couple of years before he stormed home in the Parramatta Cup at the start of his first preparation for Kris Lees, before being too strong in the Sky High Stakes over 2000m on a heavy Rosehill track last time. "He has enjoyed getting his toe in, which is what he has always wanted since he has been here. The wet tracks slows the others down and it doesn’t slow him down," McEvoy said. "It is not jarring on his body like the hard tracks. He is a horse with a few niggles and he doesn't feel them on soft ground. He has really let go well on those surfaces, which is the key to him really." Red Cardinal is $6 second favourite for the Tancred, where Godolphin trainer James Cummings believes Avilius will again shine. "Avilius demonstrated that he was back at full fitness when he scored his most convincing win yet in the Ranvet Stakes," he said. "With an unbeaten Sydney record at stake and with the best weight-for-age credentials of any runner, he appears to be perfectly placed for the quick back-up." It is a big day for Godolphin with Pohutukawa also looking for group 1 success in the Vinery Stakes with McEvoy in the saddle. 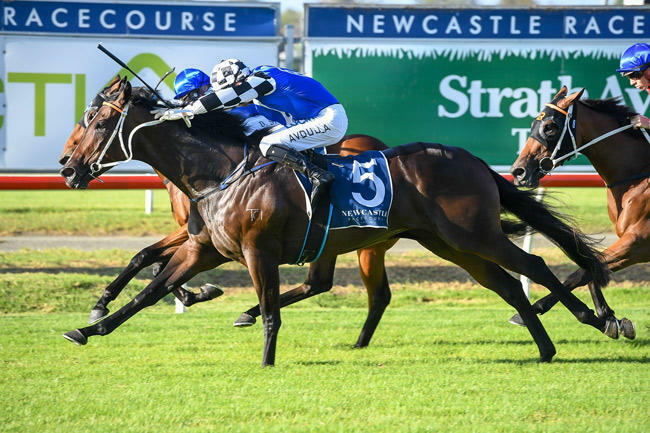 The Medaglia D’Oro filly had been considered the unlucky runner when charging to the line late in the Light Fingers and Surround Stakes where she was third and fifth respectively before she scored a resounding win in the Kembla Grange Classic. "She beat the second grade fillies at Kembla but did it really well. She gets up to 2000m, which is a trip she looking for. If we can get the right run she is going to be really strong late," McEvoy said. For the best part of eight months Princess Posh did not have a break longer than five weeks between starts, so the 14 weeks from her second to Cool Passion in the Group III Hong Kong Jockey Club Stakes at Flemington last November to her unplaced effort when resuming in the Group II Triscay Stakes at Randwick on February 16 was among the longest breaks in her 26-start career. The resilient daughter of Canford Cliffs showed she had taken plenty from her first-up run by crediting her trainer Kris Lees with his first win in the Group III Newcastle Newmarket at Broadmeadow on Friday. It was the second stakes win for Princess Posh following the Group III Tibbie Stakes over the same course and distance back in September. arrying the colours of Australian Bloodstock, Princess Posh has been unlucky in several stakes races, placing in the Group II Golden Pendant at Rosehill and Group III Tesio Stakes at Moonee Valley in addition to her near miss in the HKJ Club Stakes. Lees has another Newmarket in mind on Saturday and is on the road with three live chances, In Her Time, Brave Smash and Graff, in Saturday's time-honoured Group 1 sprint down the straight at Flemington. So, it was left to Australia Bloodstock's Jamie Lovett to break the news that the 5yo mare had likely made her final start for her present owners. "It was probably her last race," Lovett told Sky Thoroughbred Central. "She is likely to go to the (broodmare) sale now. "She has been a great horse for the owners. It's a thrill to win this race." Princess Posh advances her overall record to 8 wins, 3 seconds and 7 thirds from 27 starts with earnings of $561,520. She was a $25,000 purchase out of the Phoenix Broodmare Farm draft at the 2015 Inglis Premier Yearling Sale. A half-sister to two winners, Princess Posh is out of the winning Viscount mare The Baroness who is a half-sister to Group III Millie Fox Stakes winner A Country Girl out of the dual Listed stakes-winner Verdict Declared. The Baroness was not covered for four seasons after foaling Princess Posh but was served by Foxwedge in 2017 and was consigned to the 2108 Magic Millions National Broodmare Sale where she failed to make her $40,000 reserve. She foaled a Foxwedge filly last September and was covered by Australian Bloodstock's dual Group 1 winner Tosen Stardom (JPN) at Woodside Park last spring. Five-time Group 1 winner Canford Cliffs (IRE) shuttled to Victoria from 2012-16 and is the sire of 4-time Group winning millionaire Cliff's Edge. The Australian Department of Agriculture and Water Resources has removed the need for horses travelling from Hong Kong to go to another country before returning home, paving the way for strong Australian representation at feature Hong Kong meetings in the future. For the past 18 months, few Australian trainers have given any serious consideration to taking on the Hong Kong challenge of Champions day in April or International day in December due to Australian biosecurity measures that forced any horse returning from Hong Kong to spend six months in another country. The direct importation of horses from Hong Kong to Australia was suspended in October 2017 because of “potential biosecurity risks” the DAWR claimed could be created by the movement of horses” between Hong Kong and the Hong Kong Jockey Club’s newly created Conghua training facility in China. “Australia takes biosecurity seriously and there is evidence of equine diseases in China that would devastate Australia’s horse industries if they arrived here,” DAWR said at the time. DAWR completed an assessment of the new quarantine arrangements offered by the Hong Kong Government on Thursday and have agreed to interim biosecurity conditions which come into effect next Tuesday. 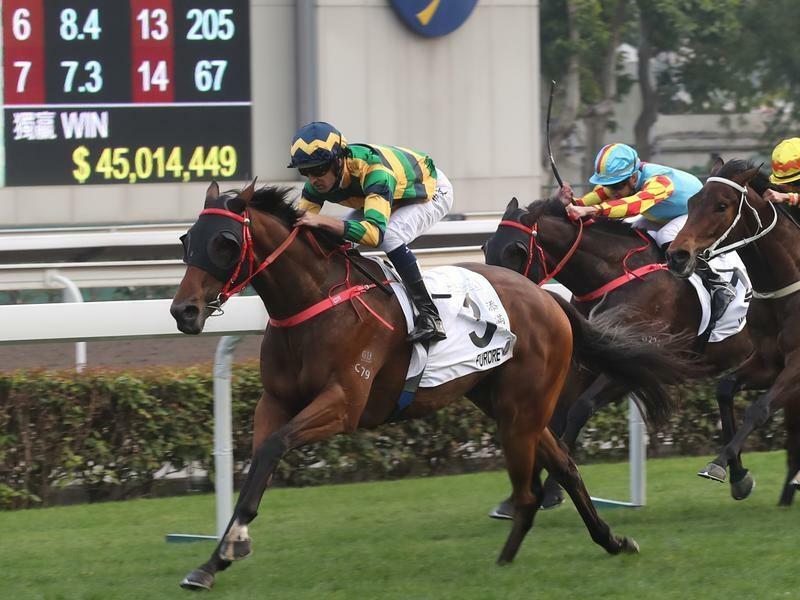 HKJC Executive Director of Racing Andrew Harding said the decision gives some surety ahead of 2019 Hong Kong International meeting later this year and he hopes for a strong Australian contingent. Formerly trained in Australia by Kris Lees, Furore claimed his first Hong Kong win at his third start for Frankie Lor in Sunday’s 1600m-race. The gelding was midfield but when Bowman shifted him out at the 300m, Gold Win was shunted sideways and caused a domino effect which earned Bowman a three-meeting ban. But Furore was impressive with Bowman saying he had the potential to continue to the Derby. “It felt every bit as good as it would have looked,” Bowman told the HK Jockey Club. Lor, a former assistant to champion trainer John Size, had five runners in the race. “I thought Dark Dream was my best chance but the only thing was the bad draw in 12,” he said. Dark Dream, the 2018 Queensland Derby winner, finished fourth. “Furore’s form has improved each race,” Lor said. Although he misses Saturday’s meeting at Rosehill, Bowman’s suspension ends in time for him to return for the rich Inglis Millennium meeting at Warwick Farm on February 9. 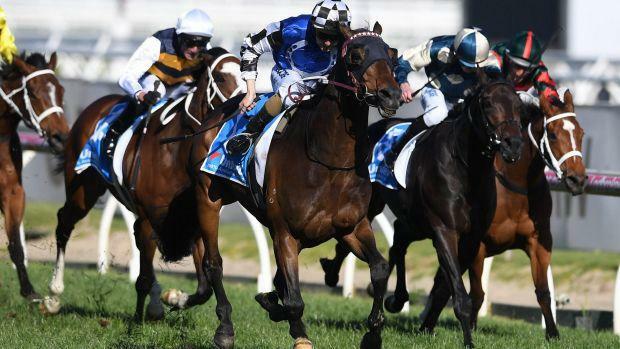 An exciting new signature race for Australian Racing has been launched by Racing Victoria and the three Victorian metropolitan racing clubs; Victoria Racing Club, Melbourne Racing Club and Moonee Valley Racing Club. The All-Star Mile gives fans a chance to vote for their favourite selected horse with an incentive for one lucky voter picked for each All-Star to become a nominal owner of that horse. 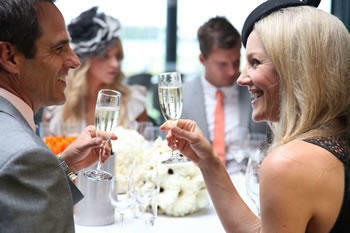 They will win a share of $500,000 in prize money as a part of the $5m overall prize. Newcastle Jockey Club chairman Geoff Barnett would not normally be happy playing golf in the rain. However, with his wet-track specialist Red Cardinal preparing for a second shot at the Melbourne Cup on Tuesday, Barnett was looking at the bright side of a round on a dreary Monday. “We’re just about to hit off in the rain so it’s not very pleasant for golf, but we do need the rain for the horse,” Barnett said from The Dunes Golf Links in Rye, south of Melbourne. 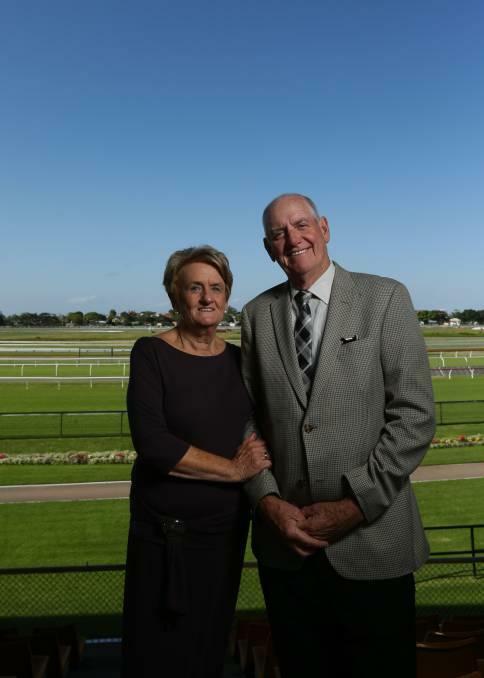 Barnett and wife Maureen are back in Melbourne as part-owners of a Cup runner after Australian Bloodstock-syndicated and Darren Weir-trained pair Red Cardinal and Big Duke gave them a first taste of the race last year. Big Duke ran fourth and Red Cardinal 11th, and both were set to return this year. Big Duke, though, failed to come up this preparation and was spelled after the Moonee Valley Cup despite sitting high enough in the order of entry to make the Melbourne Cup field. Red Cardinal was 11th in that race and showed enough for connections to press on to the $7.3 million Cup. The Barnetts and Hunter-based Australian Bloodstock also had high hopes with recent UK purchase Torcedor, which was equal second favourite in early Cup markets. But, like last year, their best chance in the race was an early casualty. In 2017, Japanese stayer Admire Deus was a leading contender before breaking down in a track gallop on Caulfield Cup eve. He was later put down. This year Torcedor was their exciting addition but illness forced him to miss quarantine and the second shipment of foreign raiders. He is expected to come to Australia after Christmas for a Sydney autumn campaign. Red Cardinal, now seven, missed the 2016 Cup in identical circumstances. Last year he was among leading picks in early markets and started a $16 chance, but he was injured on the firm Cup day surface after starting from the extreme outside barrier. In five starts back this campaign, Red Cardinal has placed just once – in the St Leger Stakes at Randwick on October 13 – which has been his only Australian run on heavy ground. Barnett hoped the wet weather, the ideal draw in five and late booking of three-time Melbourne Cup-winning jockey Damien Oliver were signs Red Cardinal’s luck was changing. He has come in from $101 to $34 in TAB Fixed Odds betting. “It’s a bit wet, but we’ve been praying for it. We could do with it and it will help our case,” Barnett said. “Hopefully it’s going to put a couple of the others off, but we’ll see what happens. “Oliver has ridden a few Cup winners so it’s worked out fantastic getting him. Regardless, Barnett was just pleased to have another starter in the iconic race after the thrill of Big Duke’s effort last year. “It is a lot of fun having one in and we’re really looking forward to it,” he said. The TRC Global Rankings are a measure of an individual's level of achievement over a rolling three-year period. They are based not on prize money the individuals' representatives have won but on the quality of the performances those runners have put up in Group and Graded races. There are about 1,450 qualifying races around the world every year. An individual’s position in the rankings depends entirely on how well their representatives have been running. Racing Post Ratings (RPRs) are used to help calculate the merit of every performance of every runner in each of the races. Individuals are positioned in the standings according to their total points (bold figure in the second column from the end). The points are derived from two numbers - Impact Value (IV) and time-decayed Racing Post Ratings (tRPR) - which are displayed in two columns in the centre of the tables. With tRPRs, we have built in a weighting that means performances count for less as they get older. So a 120-rated performance in 2016 counts for more than it did in 2015, which in turn counts for more than it did a year earlier. In general, horses achieve higher marks in the U.S., Britain, Ireland, France, Japan and Australia than they do in some other major racing nations*, like Chile, South Africa and Germany. So their trainers, owners, jockeys and stallions are largely higher in the rankings. At present, for example, three of the top five horses in 2016 on Racing Post Ratings are trained in America, one is Japanese and the other is Australian. It should be reasonably easy to understand why individuals are where they are in the tables by comparing the numbers in the IV and tRPR columns. Individuals are listed under ‘Modal Country’, which is the country where they have had the most runners and is not necessarily the one where they are based. There is a search facility with each of the categories in the TRC Global Rankings that enables you to find any individual in the top 500, or to isolate the representatives from any modal country into one list. You can click on any individual’s name to bring up a complete list of counting runs over the past three years. Each of the pages includes a link to a list of all the Group and Graded winners from the previous week (Winners), plus another (Climbers) to a list of the individuals that have gained the most points in the week. Tuesday's Melbourne Cup field could be in for a significant shake-up this Saturday with two horses that have yet to even pass the first ballot conditions for the race, set to make bold 11th-hour bids to secure spots in the field. In total, there are 47 horses remaining in the hunt for the $7.3 million purse and only three of those - Azuro, Sixties Groove and Thinkin' Big – have not met the qualifying conditions for the race. But both unqualified horses Thinkin' Big and Sixties Groove will have plenty of support from punters as they attempt to force their way into Tuesday's feature when they race at Flemington on Saturday. For Thinkin' Big, a win in the Victoria Derby - a race for which he is hot favourite - is likely to be enough for the three-year-old to be paid-up for on Saturday evening for next Tuesday's big one while the market for Saturday's Lexus Stakes suggests Sixties Groove might be one of the Cup's unlikely bolters. Sixties Groove, who is one of seven stayers trained by Darren Weir to remain in contention for a Melbourne Cup start, is to be ridden by Craig Williams on Saturday and already has had support in the early markets, firming into single figures after drawing barrier four for Saturday's race. Sixties Groove, who was purchased by Australian Bloodstock last year, won two races in Melbourne over the winter before a short break. He resumed with a placing at Ballarat in September before taking the Moe Cup earlier this month. Sixties Groove is one of 13 horses to contest the Lexus, with Weir also running Gallic Chieftain and Yogi in the final ballot-free race into the Melbourne Cup. Meanwhile, trainer Chris Waller has confirmed his Metropolitan Handicap winner Patrick Erin was still in the race for a Melbourne Cup start despite being scratched from Wednesday's Bendigo Cup with a minor elevation in temperature. "Whilst this temperature remained within normal parameters, it was decided to err on the side of caution and scratch him from today's event," the Waller release read. "We will take a blood sample from Patrick Erin tomorrow (Thursday) and that will determine if he runs on Saturday at Flemington in the Lexus Stakes with the view of qualifying for the 2018 Melbourne Cup. 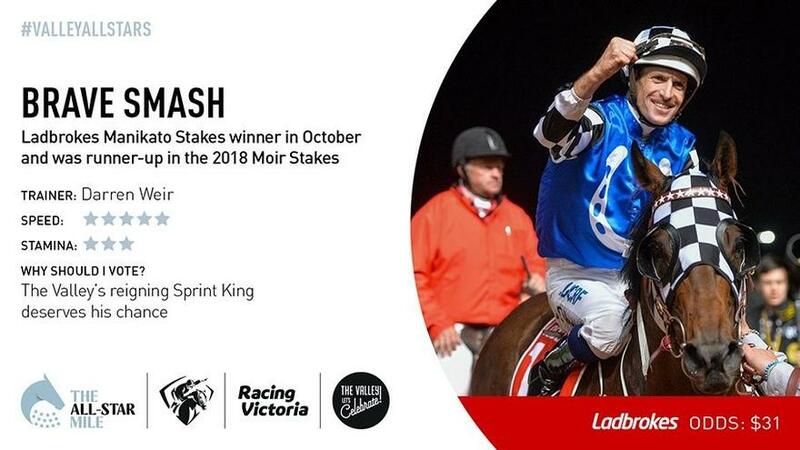 Hugh Bowman will take Group 1-winning form into Saturday’s Cox Plate after a brilliant winning steer to land Friday night’s Ladbrokes Manikato Stakes (1200m) on Brave Smash. The Darren Weir-trained entire was able to settle in the three-wide line with cover and importantly, only spotted race leader Invincible Star three lengths at the mid way point of the race. Bowman tracked eventual runner-up Spirit of Valour around the bend and claimed the lead inside the final 50m, edging out the Aidan O’Brien-trained sprinter by a neck, with a one-length margin back to the fast-finishing Kementari in third. Bowman, who is a long odds-on favourite to win his fourth consecutive Cox Plate on Winx, said the last-start Everest runner was suited back to The Valley and by the addition of blinkers. Weir praised Bowman’s positive ride and confirmed that the VRC Sprint Classic (1200m) was the likely next target for Brave Smash, who now boasts two Group 1 weight-for-age victories in the last 12 months for Australian Bloodstock. Tony McEvoy was left to rue a missed opportunity post-race with three-year-old Sunlight who failed to obtain clear running at several crucial stages of the race, while Houtzen’s running was severely impeded in the final 50m of the race, which appeared to cost her a top-three finish. Darren Weir-trained Big Duke went from a Melbourne Cup hopeful to serious contender as he took out the reinstated St Leger and is now following Prince Of Penzance's path to the first Tuesday in November. Brenton Avdulla had Big Duke travelling in the box seat and looked the winner a long way out as he held off Auvray by three-quarters of a length while they drew away from their rivals at Randwick on Saturday to the relief of Australian Bloodstock's Jamie Lovett. "In the fair dinkum department he had to win that race to be a contender in the next month," Lovett said. "He did and Brenton was able to look after him a little bit because there are bigger races to come. "'Weiry' has been training him for two miles, so you saw how strong he was at the end of 2600m and he will get better. "We thought he was a top-10 chance in the Melbourne Cup before that - he is a top-five chance now." Big Duke has been made a $26 Melbourne Cup chance, in from $34, and will head to the Moonee Valley Cup for his final lead-up. His performance added Big Duke to an impressive arsenal for the Weir stable. "That is what we wanted to see from that race," Weir's foreman Jarrod McLean said. "Prince Of Penzance ran in the Herbert Power on this day, then a Moonee Valley Cup before winning the Melbourne Cup and this bloke will follow the same path. "We always thought he's a realistic chance. Amelie's Star was really good last week and I haven't laid eyes on the Japanese horse [Admire Deus] yet but he's in Warrnambool now so I'm looking forward to getting back and seeing him tomorrow. "But this horse is a good stayer and he's had a great preparation for it, so really looking forward to what the next month holds for him." The reports were good from Avdulla, who had the race under control a long way from home and just eased Big Duke through his gears. "He has got group 1 ability. Today I travelled really sweetly. The tempo was good," Avdulla said. "He was the winner a long way out. "I went up the rise with plenty [in reserve]. When we got to the front, he had a bit of a look around but I reckon if Auvray got to me he would have kept running for me. It was soft in the end." Auvray was once again brave with Kerrin McEVoy getting held up at a crucial stage, and trainer Richard Freedman may consider continuing to the Melbourne Cup with the rejuvenated stayer. "He was better than when he won the Colin Stephen and we left him in the Melbourne Cup for a reason," Freedman said. "We will go and find a race in Melbourne and if we get some rain, even better." "We had a bit of a chequered passage from halfway home. We were unlucky because Big Duke had a break on me. My horse ran fantastic though and I'm sure there's options for him down in Melbourne now." DARREN Weir has always harboured a massive opinion of Tosen Stardom and he finally delivered in the Toorak Handicap and sectionals suggest another Group 1 win awaits him this spring. His jockey Damian Lane said Tosen Stardom was travelling so well before the turn he was giggling to himself. When he let him go he produced a closing sectional for the last 400m of 23.52sec with a big weight of 57kg after sitting wide throughout. He covered 1631m which was 13m further than the runner-up Sovereign Nation. Third placegetter Petrology bettered his last 400m coming home in 23.49sec but Tosen Stardom ran eight metres further than him. The Caulfield Guineas was a race of attrition as the leaders compounded after running the first 800m in 46.92sec compared to the Thousand Guineas49.35sec and as a result the closing sectionals in that race were relatively slow. That Tosen Stardom had the ability to win a group 1 was never questioned. But whether he could achieve that feat remained unanswered until his breakthrough group 1 win in the Toorak Handicap on Saturday at Caulfield. Having arrived at the Darren Weir stable from Japan with the goal of winning a race that matched his talent and pedigree, he had come close before without saluting. That's why the trainer took a sigh of relief when Tosen Stardom, ridden by Damian Lane, crossed the line first in the 1600-metre handicap to record Weir's second group 1 for the day, another first for the Victorian trainer. "It's just a relief that it is done because he is such a talented horse that has been plagued by problems that has got this amazing pedigree to back it up," Weir said. "It is important that he is a group 1 winner now." Weir arrived at the track confident that after three runs in relatively quick succession he had managed to get Tosen Stardom fit enough to win a big race. "The key to today was to being able to get a few runs into him," Weir said. Lane sensed that fitness as the field straightened with Tosen Stardom travelling so well he couldn't wait to unleash him in the run to line. "It was a matter of how far when I straightened," Lane said. "I was getting itchy fingers, getting sick of holding him." Lane thought the Emirates Stakes at Flemington could be a good race for Tosen Stardom now he has broken the duck and Weir confirmed he would not be tempted to run him in the Cox Plate. With the group 1 in the bag and the horse fit enough for Weir to move forward with confidence, Tosen Stardom is likely to feature at the front of the big miles in Spring. "He's got the ability to do it. It's just whether his body lets him do it. He's in great shape now," Weir said. And he can now run free of the pressure that was slowly building. "He's a really good horse. He'll make a great stallion," Weir said. Craig Williams has given a glowing endorsement of Cups contender Admire Deus after piloting the Japanese raider in a strong gallop at Werribee on Tuesday morning. The Darren Weir-trained stayer was given his most serious piece of work since arriving in Melbourne seven days ago, warming up with stablemate Sixties Groove before working solo from the 1600m chute. Williams, who partnered the entire for the first time during a recent trip to Japan, let Admire Deus build into his work gradually before clicking him up a gear at the 800m and was delighted with the response from the seven-year-old. "I've been really happy with his preparation and Darren Weir has been down to look at him and he's really happy with the way he looks since he's come out," Williams said. "He was in good order this morning, nice and fluent in his action and every time I asked him he responded nicely. "He is actually rated higher than those two horses (Admire Rakti and Hokko Brave) and his form suggests he can win the Caulfield Cup and he can win the Melbourne Cup. "Most importantly, so far in his work he's felt like he has brought that out to Melbourne which is fantastic." 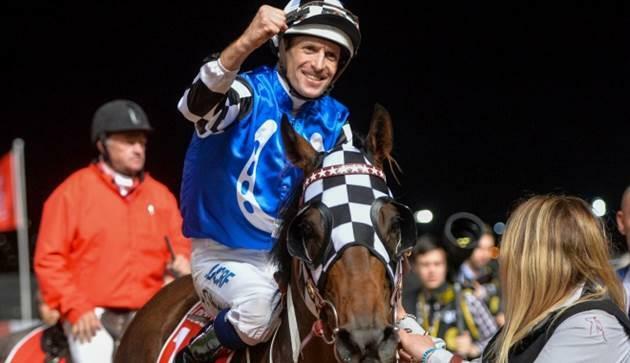 Williams' 23-day careless riding suspension ends on Saturday night and the star jockey said he was looking forward to returning to the saddle for the pointy end of the Spring Carnival. But it's looking likely the Caulfield Cup (2400m) will be the first Group 1 race he tackles after forfeiting key rides on Caulfield Guineas Day to partner Vega Magic in the $10 million Everest at Randwick. "I've only had two rides on him (Vega Magic) for two Group 1 wins and when I got the phone call (to confirm I was riding him) I was delighted," he said. "His last performance was excellent, he fits the bill for the race and I know the stable is very confident with the way he has trained on. 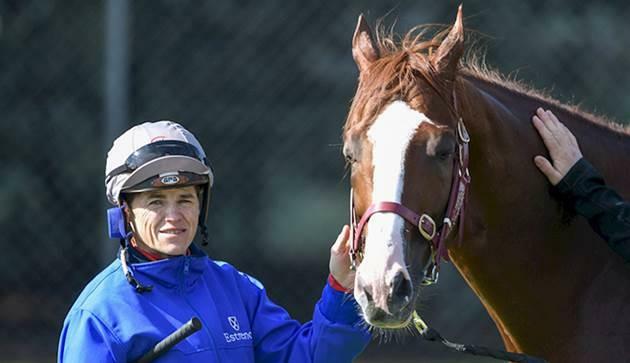 "If I was stuck back home at Caulfield for the day I would be delighted as well and it's just a shame that these two feature racedays have to clash. "It was a difficult decision (to ride in Sydney), not only because there are four Group 1 races on the day, but because it's a platform for other feature races to come." 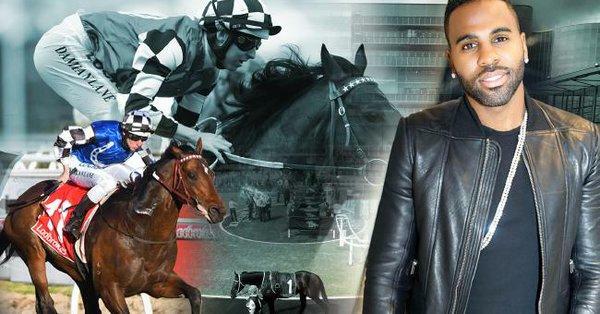 The Australian Turf Club today announced multi-platinum recording artist Jason Derulo will perform a free concert for racegoers at the inaugural The Everest, an exciting new horse race with prizemoney of $10 million. The Everest will be run at Royal Randwick Racecourse over 1200 metres on 14 October 2017. 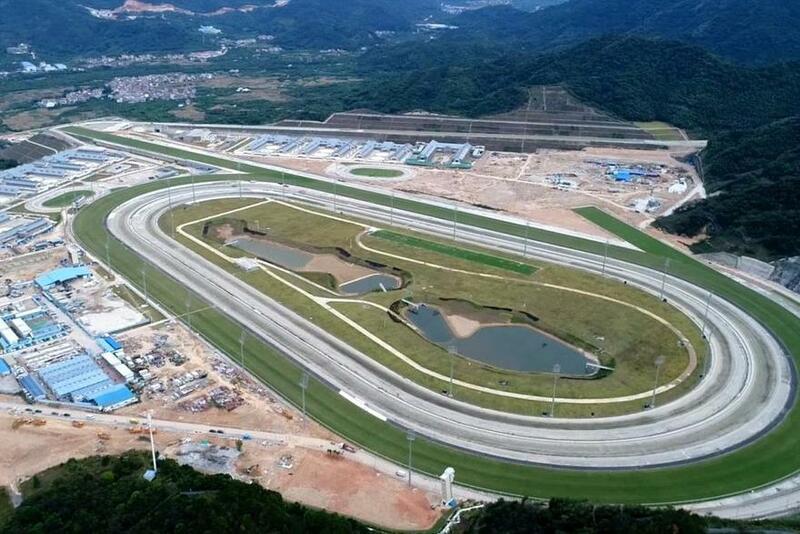 The $10 million prize pool not only makes this event the richest 1200 metre race in the world, but also the richest race on turf in the world. Derulo will perform a free and exclusive, 60-minute concert for all ticket holders after the last race, in The Theatre of the Horse – part of Royal Randwick’s $170 million refurbishment. Known for his flawless vocals and precision choreography, Derulo’s latest single ‘If I’m Lucky’ is rocketing up the charts and currently sits at #9 on Shazam Future Hits. His other recent hits include ‘Swalla’, ‘Talk Dirty’, ‘If It Aint Love’, ‘Hello Friday’, ‘Want To Want Me’ and ‘Trumpets’. The Everest is a joint venture between Racing NSW and the Australian Turf Club, who together share a vision to see Sydney racing explode onto the world stage. Royal Randwick itself is an international landmark, annually attracting visitors from all over the world to enjoy its premium facilities and magnificent outlook in the heart of Sydney. It’s not only international artists appearing at the Everest, The Australian Turf Club has secured agreement with Australian Bloodstock to have former Japanese galloper Brave Smash represent the Club in the $10 million The Everest at Royal Randwick on October 14. 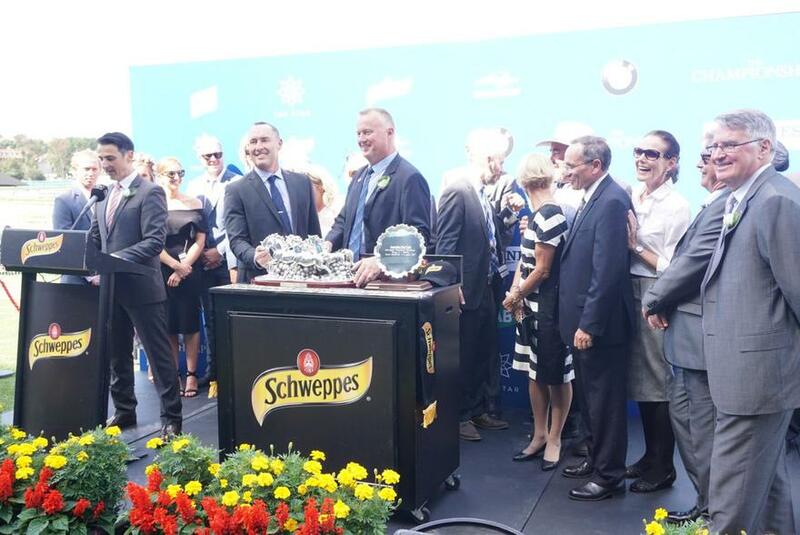 Australian Turf Club Executive General Manager Racing James Heddo said the ATC was delighted to partner with Brave Smash who is currently rated in the top five of betting for The Everest. “The ATC is committed to building the international profile of our Carnivals and our racing, and to attract more overseas competitors to our racecourses. Brave Smash offers a point of difference to The Everest with his international background and pedigree. “In Brave Smash, we believe we have the X-Factor in what is already shaping as the biggest sprint race in the world, and one that we feel privileged to be part of. 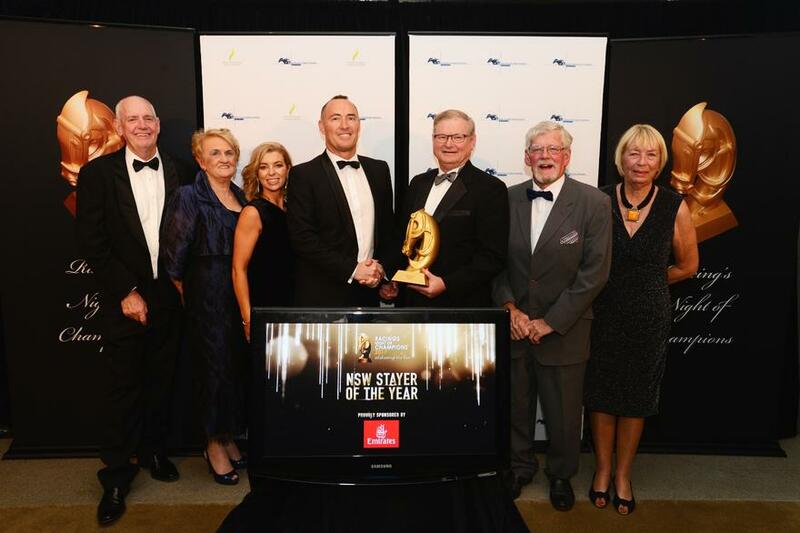 BIG DUKE " Stayer of the Year 2017"
Big Duke’s NSW Stayer of the Year award at 2017 Racing’s Night of Champions. CLAUDE Renshaw is from a family steeped in racing tradition. His father (also Claude) raced the brilliant and versatile Group 1 performer Shaftesbury Avenue (trained by the late Bart Cummings), who won no less than six Group 1 races in the early 1990s. Now, he is enjoying his own racing ride – thanks to his involvement with leading syndicators Australian Bloodstock. With an interest in “about 25 horses”, Renshaw part-owns promising stayer Big Duke, placed in the 3200m Group 1 Sydney Cup at Randwick on April 22 and a definite contender for Melbourne Cup honours at Flemington in November. He also recently celebrated an international success with former English filly Delectation, who won a Group 3 race at Cologne last month on debut for Germany’s Andreas Wohler, the training wizard who won the 2014 Melbourne Cup with Protectionist. Delectation, now unbeaten from three starts, is heading for the French Guineas at Deauville on May 14 – and if she performs well, a return trip to England is in the offing for the Coronation Stakes at Royal Ascot on June 17. Renshaw, who grew up at Binnaway in central western New South Wales before later moving to Sydney, is currently in charge of developing a Wagyu cattle operation in Queensland. And whilst he isn’t getting to see as many of his horses race as he would like, he is certainly keeping up to date with their progress. “Big Duke has given us some terrific thrills with his performances since coming to Australia, and he ran really well in the Sydney Cup,” Renshaw said. BY his own admission, DAVID BARTHOLOMEUSZ says he made some “really poor decisions” in racing a few decades ago. “Additionally, in the early 1990s I got involved with a property at Yarramalong on the Central Coast and some racing stock, and it cost me a lot of money,” Bartholomeusz said. Thankfully, those bad times didn’t completely dull his continuing interest in the industry. 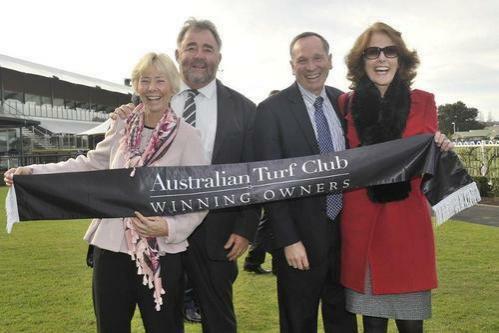 Now, thanks to his association with leading syndicators Australian Bloodstock, he is sharing in the good times. 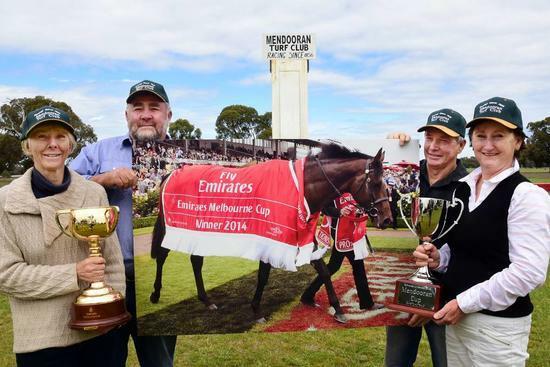 IT’S a mighty long way from winning a maiden race at Gilgandra to standing in the winner’s stall at Flemington and celebrating a Melbourne Cup success. 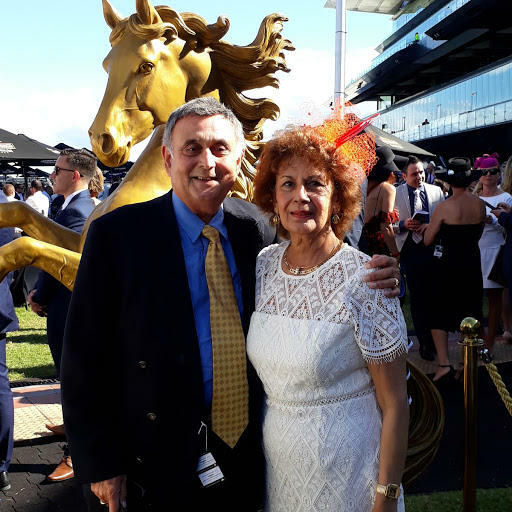 But John Hunter has scaled those lofty heights – and says it would not have been possible had he not become involved with leading syndicators Australian Bloodstock. 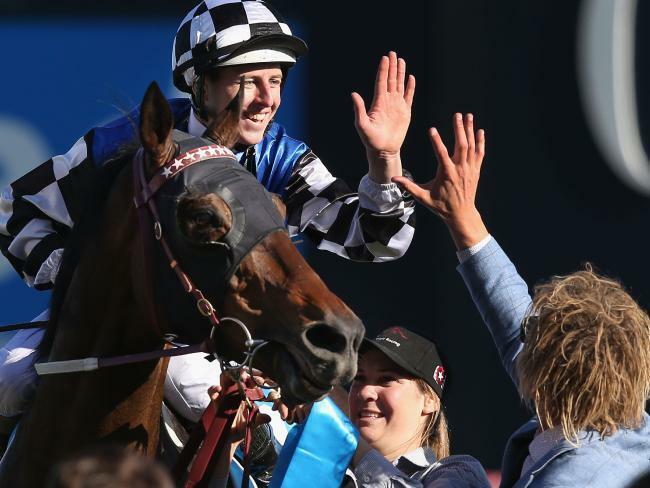 As one of the owners of 2014 Melbourne Cup winner Protectionist, the Mendooran (NSW) farmer understandably rated the German stayer’s runaway victory, with English jockey Ryan Moore aboard, as his greatest thrill in racing. “It’s been a wonderful association and, of course, still is with Australian Bloodstock,” Hunter said. Raceday Dining & Information can be viewed here.